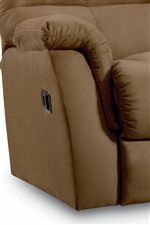 Gently move back and forth from the comfort of your glider recliner. As you watch TV or read, gently glide to keep your muscles active and to keep from feeling antsy. A chair fitted with a glider base can also be a great addition to the nursery in your home, allowing you to spend quality time with your child while providing them with the comforting movement they desire. Made for lazy afternoons and relaxing at the end of a long day, this recliner is a soft and supportive piece with a cozy, laid-back look. Activate the leg rest and prop up your legs where they will be gently supported by plump chaise lounge cushions, decorated by contrasting double stitching. 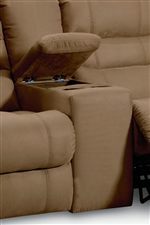 This recliner is outfitted with thick, high resilience, foam and fiber fill cushions for optimal seating comfort. 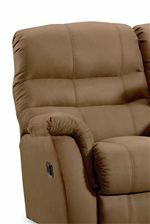 The Garrett Casual Garrett Glider Recliner by Lane at AHFA in the area. Product availability may vary. Contact us for the most current availability on this product. Tailoring Contour designed and tailored for maximum comfort. Recliner Mechanism Mechanism is precision engineered & balanced for maximum comfort and ease of operation, featuring shoulder riveting in major wear points, lubricated pivot joints, Delrin spacers, and an oven-baked finish. The Garrett collection from Lane Furniture is a stunning selection of supremely comfortable manual and power recliners. With a selection that runs the gamut from wall recliners to reclining loveseats to dual-reclining sofas, the Garrett collection has a piece to meet the needs of your household. Exceptional for furnishing your living room or home theater, the Garrett collection even includes a console piece perfect for holding your drinks and snacks. These upholstered pieces provide optimal support for the body with plush high-density foam and plump pillow arms. The power recliners featured in this collection activate with a slow, gentle movement acceptable for people with all levels of mobility. The Garrett collection is a great option if you are looking for Casual furniture in the area. Browse other items in the Garrett collection from AHFA in the area.